I successfully defended my PhD dissertation in October, and officially graduated in December. This year I’ve been having a lot of fun teaching in a 1-year visiting position at my alma mater, Williams College. I accepted a tenure-track position in the Department of Mathematics & Computer Science at Hendrix College in Conway, Arkansas, and will be moving there this summer! I had a paper (co-authored with Dan Piponi) accepted to the Mathematics of Program Construction conference this summer. It brings together a lot of cool ideas from functional programming, combinatorics, automata theory, calculus, and linear algebra, and might be of interest to some readers of this blog. You can read more about it on my other blog; here’s a link to a PDF. 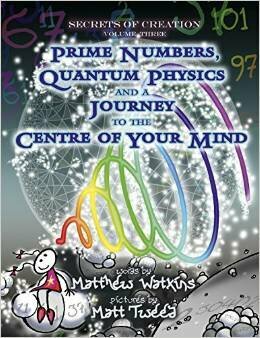 I also want to help spread the word that Matthew Watkins’ wonderful Secrets of Creation Trilogy has been republished in a new edition by Liberalis Books. I previously reviewed the first and second books in the trilogy (tl;dr: they are fabulous). I have now read the third book in the trilogy (depicted above), which is just as fabulous, though I never reviewed it here. And if you don’t believe me you can see what others (including Sir Roger Penrose and Clifford Pickover) have said about it. I highly recommend that you check them out if you haven’t already!